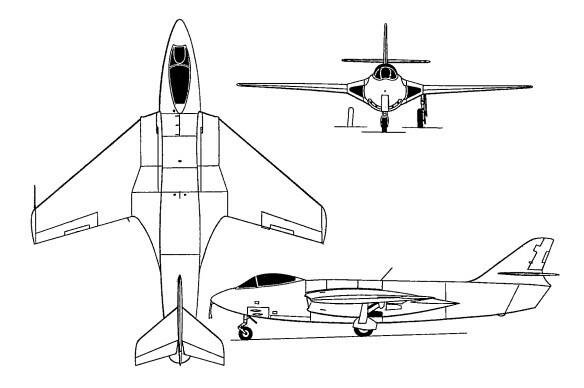 Developed as a result of Australian interest in an operational fighter version of the P.1052 swept-wing research aircraft, the P.1081 was a rebuild of the second P.1052 incorporating a straight-through jet pipe, using a jet pipe adapted from that of the Supermarine Attacker, and a new all-swept tail. Non-availability of the Rolls-Royce Tay turbojet proposed for installation resulted in retention of the original 2268kg Nene R.N.2. With this power plant, the P.1081 was flown on 19 June 1950. Consideration was given to building a second, fully representative prototype with a four 20mm cannon armament and an afterburning Tay engine, but, on 14 November 1950, further work on the Australian project was cancelled. The sole P.1081 was subsequently transferred to the RAE, but was destroyed in an accident on 3 April 1951. Engine: Rolls-Royce Nene, 5000 lb (2268 kg).